Enacted in response to multiple corporate accounting scandals, the Sarbanes Oxley Act (SOX) (also known as the Public Company Accounting Reform and Investor Protection Act) safeguards investors from fraudulent activities involving internal employees. Heavy penalties and stringent regulatory standards are imposed to ensure all the financial information processed by an organization is genuine and reliable. DataSecurity Plus is an audit tool that delivers the visibility required to monitor and track the validity of all financial information in an organization. DataSecurity Plus' various reports can help you manage the difficult task of proving compliance while ensuring the security of your financial data. 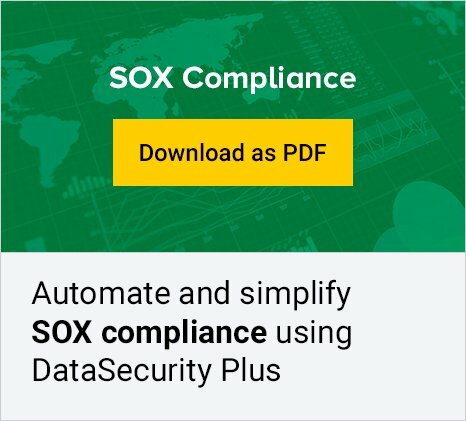 Below is a list of reports you can use to prove that your organization is compliant with the SOX.